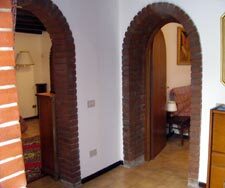 The entrance foyer has two arched brick doorways: one to the living room (left), and another to the bedroom. The foyer itself has a chest of a drawers and a closet (not shown) with cleaning supplies. Inside the closet is a metal panel that drops into place by the front door to minimize flooding during acqua alta or "high water," which can occur in the late fall and winter months. Update: During another visit to the neighborhood, I checked street outside the apartment during an acqua alta flood when the Piazza San Marco was at least 15 cm or 6 inches deep in water, and both the street and the nearby Campo Santa Maria Formosa were dry.